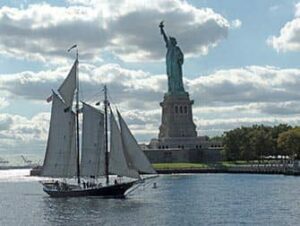 Sail the waters of New York on the Statue of Liberty Tall Ship Sailing cruise! The Clipper City is a spectacular 47 meter tall ship with masts reaching a height of 36 meters. Taking a water cruise will never be the same again. This cruise departs from the south end of Battery Park in Lower Manhattan (take subway 4 or 5 to Bowling Green or 1 to South Ferry). 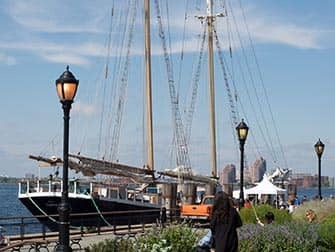 There are seven different cruises: the Statue of Liberty Sail, the Twilight Sail, the Harbour Lights Sail, the Burlesque Sail, the Craft Beer Sail, the Lobster & Beer Lovers Sail and the Harbour Evening Sail with Live Jazz. Each provide a peaceful 1 – 2 hour cruise across the New York Harbour. 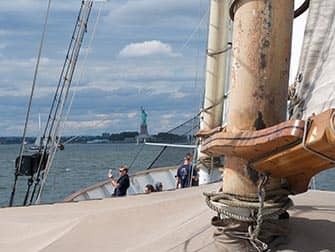 Whether you want to snap photos, just unwind or be amazed by the night lights of Manhattan, taking the Statue of Liberty Tall Ship Sailing Cruise is absolutely worthwhile. After purchasing, you will receive a voucher that you can print out and use as your ticket for the boat tour or show as a mobile ticket on your phone.